That you can buy a capable gaming platform such as the Digital Storm Vanquish II Ultimate for a mere $1269 speaks well of the GPU industry. With Nvidia’s GeForce GTX 770 and its 2GB frame buffer on board, Digital Storm’s Vanquish II Ultimate blazed its way through our 1920x1080 gaming tests, and even had enough juice to maintain playable (if not optimal) frame rates at 2560x1600. The only area where this PC will fall short for some is expansion: It doesn’t have enough memory slots, PCIe slots, or SATA ports. 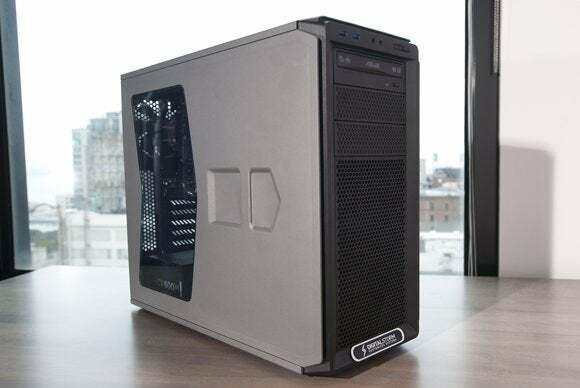 Styled in an attractive combination of gray with blue lighting, the Vanquish II Ultimate, sports a mid-range Intel Core i5-4570 CPU. A Core i7 would be nice to have, but with 8GB of memory on board a Core i5 feels about the same subjectively, once Windows has done its caching thing. Besides, most games rely more on the GPU than the CPU. The Vanquish II's micro-ATX motherboard will put a crimp on your expansion and upgrade plans: It has just one x16 PCIe slot (occupied) and only one available SATA port (and that's a SATA 3Gbps port). 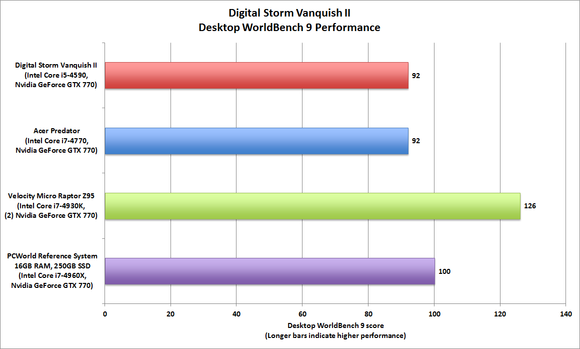 Even with its “lesser” CPU, the Vanquish II still scored a WorldBench 9 score 92, and it certainly felt responsive in our hands-on. The 128GB Samsung 840 EVO SSD (even without its included caching software running) had a lot to do with that. An SSD of that size can be filled quickly by games and video, so Digital Storm augments the 840 with a 1TB Seagate ST1000DM003-1CH162 hard drive. It's odd to see an old-fashioned parallel port on a modern PC. Fortunately, its presence is more of a distraction than a detraction. 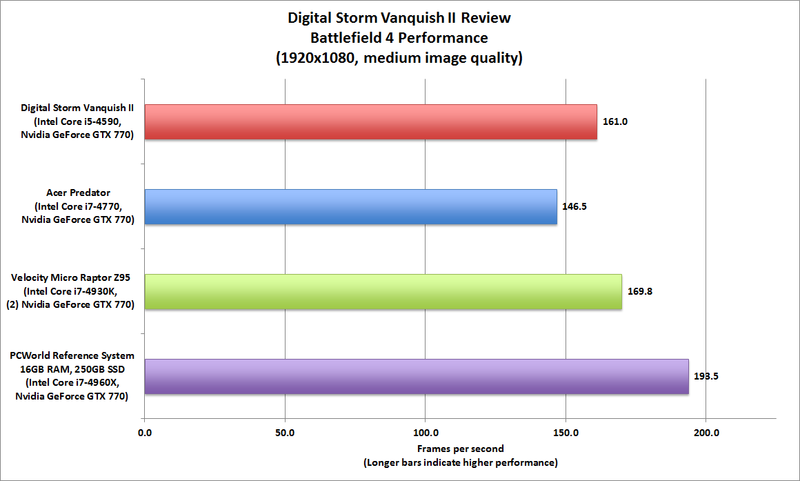 As to the Vanquish II Ultimate’s raison d’être, gaming frame rates averaged above 150 per second in all our 1920x1080, medium image-quality tests (Battlefield 4, Grid 2, and BioShock Infinite). That average dropped to just 40 frames per second when we upped the screen resolution to 2560x1600 and image quality to ultra. Given the price tag, that’s pretty darn good. The only way you’ll do better in a single-card system is with a Nvidia GeForce GTX 780. We’re a bit surprised one isn’t offered as an option, though $1500 doesn’t sound nearly as affordable as $1269. Then again, $1269 doesn’t sound as affordable as the $700 that the entry-level Vanquish II with a Core i3 and GTX 500 will set you back. Just sayin’. The Vanquish II earned a very respectable WorldBench 9 score. The Velocity Micro machine is outfitted with two Nvidia GPUs running in SLI. The old-school theme continues with mouse and keyboard PS/2 ports. As I still use IBM model M keyboards, I like that, but I’m probably in the minority; most users will find the PS/2 ports as superfluous as the parallel port. For connecting more modern peripherals, the Vanquish II has two USB 3.0 ports on the front of the box and two on the back (with USAP support), along with two USB 2.0 ports. 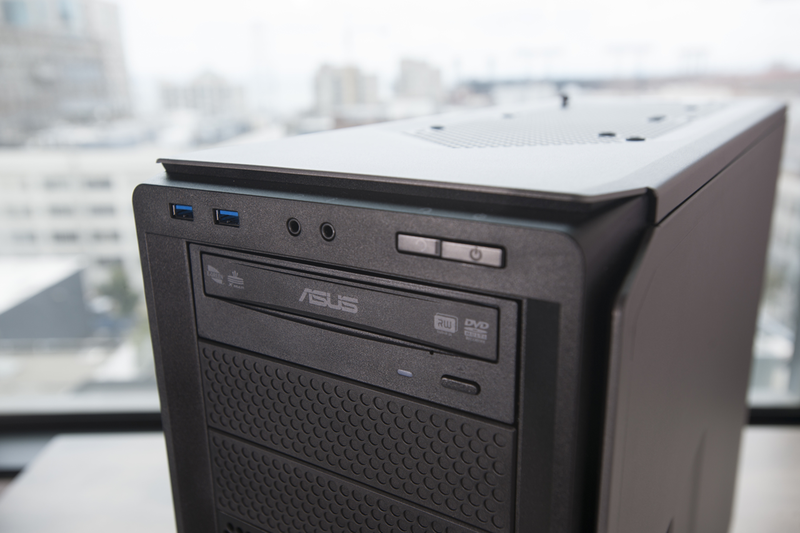 The GTX 770 has two HDMI ports, a DVI-I port and a DVI-D port. 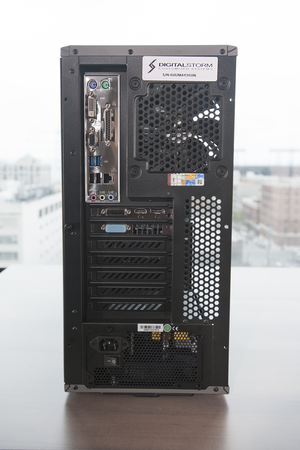 There are also DVI-D and VGA ports on the motherboard, driven by the Core i5-4570’s Intel HD 4600 graphics. That last could be handy if you wish to re-task the micro-ATX motherboard at some point when you upgrade the system. The Vanquish II gets the job done without a lot of flash and drama. While the Vanquish II Ultimate is suited to its gaming task, its motherboard is expansion-challenged from a performance perspective. The sole x16 PCIe slot and both memory slots are occupied, and there’s only one available SATA port (a SATA 3Gbps port). The system's SSD and hard drive occupy its two SATA 6Gbps ports, and the optical drive uses one of its SATA 3Gbps ports. The other two PCIe 2.0 slots, meanwhile, offer only one lane each (that’s not adequate for an add-on SATA 6Gbps controller and full SSD performance). So your performance-enhancing options are limited to adding one SSD or hard drive, or perhaps upgrading to RAID setup. This machine's gaming performance. But its lack of expansion opportunities might crimp your style down the road. There’s plenty of room inside the Vanquish II Ultimate’s mid-tower case. Only one of its three externally accessible 5.25-inch drive bays is occupied (by a DVD burner); there are four side-facing internal 5.25-inch bays, with only one filled with the hard drive; and there are three open half-height, 3.25-inch internal bays. The 600-watt power supply should be able to keep up with whatever you drop in there. Limited expansion aside, the Vanquish II Ultimate should satisfy the needs of all but the pickiest of gamers. 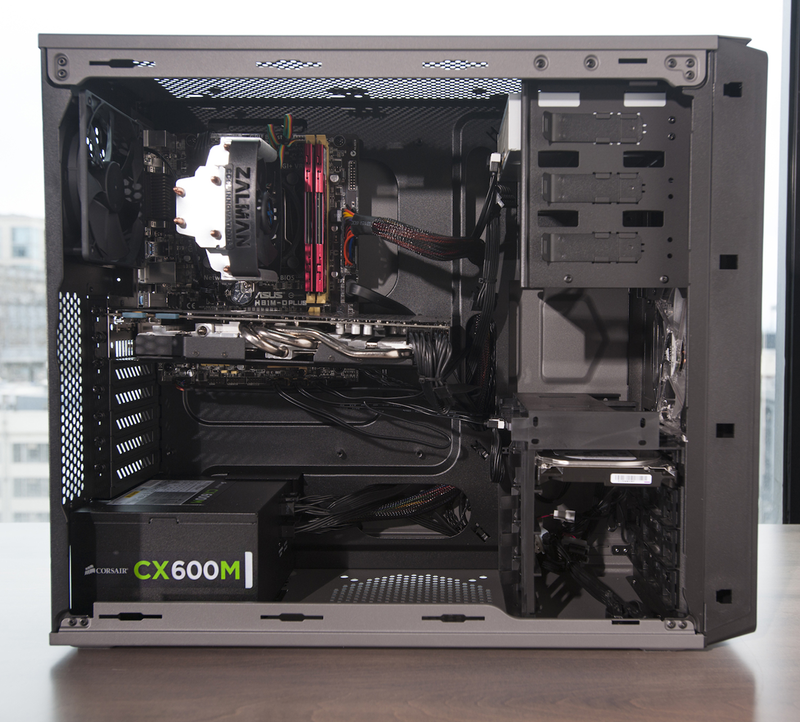 It’s a nicely-realized, relatively low-cost gaming rig. This nicely realized PC has everything you need to game at 1080p, but its expansion options are limited.